Jill and Von made this fun pie for Father's Day. 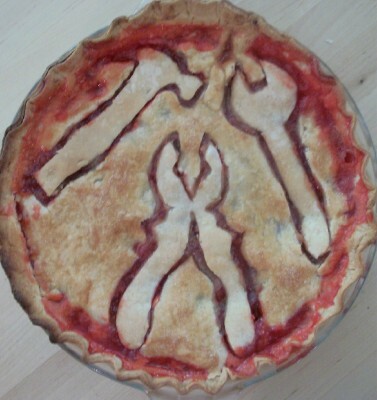 They baked a yummy pie and then cut out tool shapes from the top crust because tools are Von's dad's favorite. You could use the same idea with your Dad's favorite things, or you could even just just out a message like #1 Dad. You can read more about making the guy pie and get the recipe for her yummy Rhubarb Apple Pie over at Kitchen Fun With My 3 Sons.